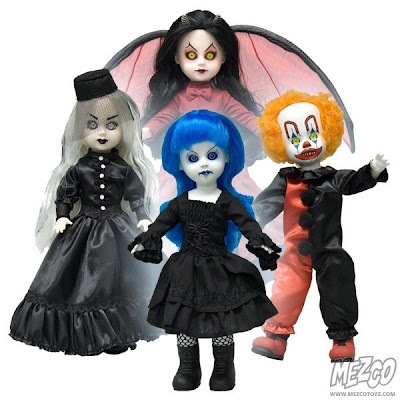 To celebrate the 2012 San Diego Comic-Con, Mezco released their sixth Resurrection dolls set as a convention exclusive. "Ms. Eerie" features long white hair, a veiled fez, and an elegant black sateen gown. Like the rest, she's a limited edition of just 300. 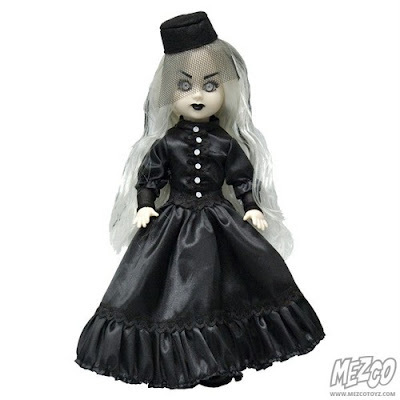 The original Ms. Eerie, from Series 4, had blonde hair and a lacier dress. Blue features shocking electric blue hair, a ruffly black dress, and fishnets. This Blue is quite different from the series 9 Blue, who wore ugly plaid pants. Demonique is my favorite, with her gauzy red demon wings. She's quite a departure from the original Demonique (from Series 10) who had gray hair and wore a quite different outfit. I'm scared of the Schitzo clown resurrection doll so I refuse to post his picture here!